Moonshot and Fail Fast Innovation? Chinese processing equipment – low cost but can you ensure good value? 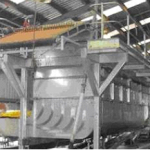 One of Foodstream’s earliest projects was the design of a fluid bed dryer for Nerada’s tea processing plant in north Qld. FoodStream used a very innovative approach – traditional design of fluid bed dryers rely on a restrictive bed plate to ensure even air flow – but this means high pressure drop and high fan power. In this case we used Computational Fluid Dynamic (CFD) techniques to design a system of vanes to ensure uniform air flow – which meant we could use a more open bed plate. 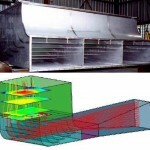 The result was a design that used only 40% of the fan power of an equivalent traditional design. In this case, that equated to an annual saving of $30,000 (at 2006 electricity prices) and 260 tonnes of CO2. A fact sheet on the project is available HERE. The project was supported by Qld government “Sustainable Energy” funding available at the time. FoodStream can work with companies to access support available for clean energy projects and general innovation/R&D. For example the Commonwealth government “Clean Technology Innovation Program” has a “Food & Foundries” program that specifically supports the food industry.Contact us using the form on this page (or phone us on 07 3137 1433) if you would like to discuss a potential project. I am indeed so happy to see my results because I know that this is a tough course. Many thanks to you for being such a wonderful lecturer. Hope to meet you in future trainings.